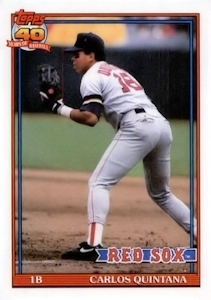 ON THIS DATE (July 30, 1991) ... After an amazing performance in which Carlos Quintana made his debut in left field in flawless fashion, he spiced the day by driving in six runs in an 11-6 victory that ended the worst Red Sox victory drought at Fenway Park since 1927. All six of The Q's RBIs came in the third inning as the cornerstone of a season-high 10-run splash by the Red Sox. His big blow was a grand slam off Oil Can Boyd, who had walked the bases loaded. For good measure, Quintana drove in two more runs with a double off Wayne Rosenthal on his second turn at bat in the inning. After the 10-run third, though, Sox hitters went back into their funk against Rosenthal and two other relievers. But it hardly took anything away from Quintana, who became the 11th player to share the major league record of six RBIs in an inning. The most recent was Dale Murphy for Atlanta on July 27, 1989. It hadn't happened in the American League since Jim Lemon did it for the Washington Senators on September 5, 1959.